South Gallia senior Aaron Schoolcraft (52) recovers a fumble during a 2014 Week 8 football contest against Wahama at Bachtel Stadium in Mason, W.Va. The focus of this week has been on the 2015 schedules for each football team within the Ohio Valley Publishing area. This weekend, we’re going to take a little wider view of the leagues and teams associated with Gallia, Mason and Meigs counties. In breaking down the area’s football schedules in a week-by-week format over 11 weeks, several contests stood out as games of interest — regardless of where you are from. The OVP area’s schedule is broken down from start to finish, and each team that is associated with TVC Ohio, TVC Hocking or SEOAL is also included in the list. There are also a pair of Jackson County (Ravenswood and Ripley) and Putnam County (Buffalo and Winfield) programs included on the West Virginia side. Week 1 is always important for any gridiron team, as it sets the tone for the rest of the season. This year, the opening game of interest will be at Farmers Bank Stadium Holzer Field when Meigs and Gallia Academy renew a rivalry that hasn’t been played in nine years. The Blue Devils — who claimed a 28-6 win at Bob Roberts Field in 2005 — lead the alltime series by a 24-9 margin, which includes eight straight victories and 19 wins in the last 20 meetings. Athens begins the post ‘Burrow and Company’ era by hosting Logan in that Friday night, while Nelsonville-York goes to Trimble for a Saturday night contest to open the year. Week 2 proves to be intriguing as Ripley travels to Point Pleasant and Buffalo heads to Symmes Valley. Frontier also visits Southern that Friday night, while NYHS travels to Newark Catholic for a non-league clash Saturday night. In Week 3, Point Pleasant travels to Wayne for a battle between perennial playoff powers. River Valley goes to Eastern in a pivotal non-league matchup, while Jackson travels to West Jefferson and Winfield hosts Ripley. GAHS makes its home debut in Week 4 as it hosts Marietta, while up-and-coming Manchester travels to South Gallia for a non-league matchup. Point Pleasant makes a difficult trip to Logan, while Alexander goes to Athens for the TVC Ohio opener. River Valley looks to end an 11-year losing skid to the Marauders when it travels to Meigs in Week 5, while GAHS travels to Point for a second consecutive season and SGHS is at Eastern. Week 6 may once again decide the TVC Hocking as Trimble comes to Wahama. PPHS travels to Parkersburg South for a pivotal non-league matchup, while GAHS hosts Athens and Meigs hosts NYHS. Wahama comes looking for revenge in Week 7 when it travels to Eastern, while Point makes another difficult road trip to Oak Hill. Meigs is also at Athens and South Charleston is at Ripley. Meigs renews another old rivalry in Week 8 when its hosts Jackson. The Marauders and Ironmen have not played one another since 1982, with JHS owning a slim 8-7 alltime edge in the series. 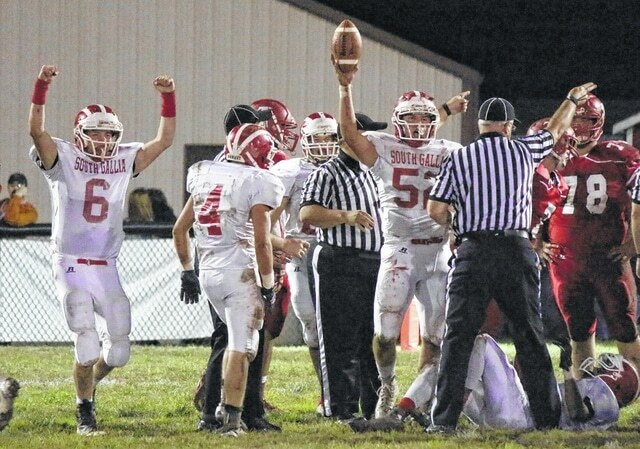 South Gallia is at Wahama and Point Pleasant hosts Ravenswood in a pair of important Week 8 contests. Playoff implications may be on the line when Southern goes to SGHS in Week 9, with the same also being true of Athens at River Valley, Trimble at Alexander, and Buffalo at Fayetteville. The final week of the Ohio regular season sees traditional matchups such as GAHS at Jackson and Eastern at Southern. St. Marys is also at Ravenswood during Week 10. Both Point Pleasant and Wahama will be on the road with respective Week 11 matchups against Princeton Senior and Buffalo. Ravenswood also travels to Ripley for the annual battle for Jackson County bragging rights. Here is a complete look at all of the week-by-week matchups in and surrounding the OVP area.